Dive head first into the world of Lundinor in this magical adventure story for anyone with a Hogwarts-shaped hole in their life. When their grandmother Sylvie is rushed to hospital, Ivy Sparrow and her annoying big brother Seb cannot imagine what adventure lies in store. Returning to Sylvie’s house, they find it has been ransacked by unknown intruders – before a mysterious feather scratches an ominous message onto the kitchen wall. A very strange policeman turns up on the scene, determined to apprehend them . . . with a toilet brush. Ivy and Seb make their escape – only to find themselves in a completely uncommon world, where ordinary objects have amazing powers. The forces of evil are closing in fast, and Ivy and Seb must get to the bottom of a family secret . . . before it’s too late. 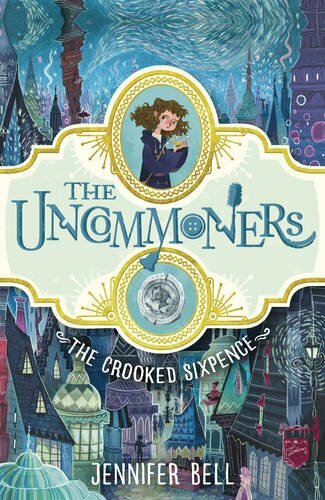 The Crooked Sixpence is the first book in The Uncommoners series by Jennifer Bell. She is a bookseller by day at Tales on Moon Lane, London (the real London), and a writer by night. The sequel, The Smoking Hourglass, is coming to a magical bookstore near you in Spring 2017 and I, for one, just can't wait! Slowly and seductively you take a journey through this book to an alternative version of London. If you look deep down beneath the streets you might just hear a feint uncommon whisper calling you, the reader, to a place called Lundinor. A journey in an UNCOMMON suitcase will lead you into a world of immense imagination that will set your fantasy brain stirring. Both the setting and the characters come alive page by page. You will love Ivy and Seb, the main characters, who are brother and sister and have a typical brotherly/sisterly relationship. They look out for each other and work together to uncover the mystery of a villainous society that has kidnapped their parents. Ivy is the star of the show; she is a great female character: brave, bold and has hidden talents that will keep the readers on their ordinary toes. This is a brilliant book for young people who enjoy magical and mystery adventures. It has a quirky plot that will turn your world upside down, but you will absolutely love it. The story is a creative ensemble of mayhem full of oodles of charm. The idea that ordinary objects can have amazing powers brings excitement such as paper clips turning into handcuffs, candles that make you invisible and lemon squeezers that give light. These are just some of the ingenious ideas that make this read standout. It is creative imagination at its best. This fantastic story oozes wickedness. Full of action, you will certainly be whipped into a vortex of weirdness through the pages. It is a great slice of dark fantasy, which is fun to read at all ages, but especially age 9+. This is a book that parents should make a bee-line for, especially reluctant readers as they will be engrossed for hours and hours. It is a cracking debut book with hopefully many more to come in the series.